Dancing and candy at a shul founded by German Jews by way of Shanghai – J.
B’nai Emunah might also be the most idiosyncratic synagogue in San Francisco. It is affiliated with the Conservative movement, but the rabbi is Reconstructionist, and the Shabbat morning service I recently attended was somewhere in between. At first it resembled a Reform service, but by the end we were doing a full Musaf, which Reform Judaism did away with over a century ago. 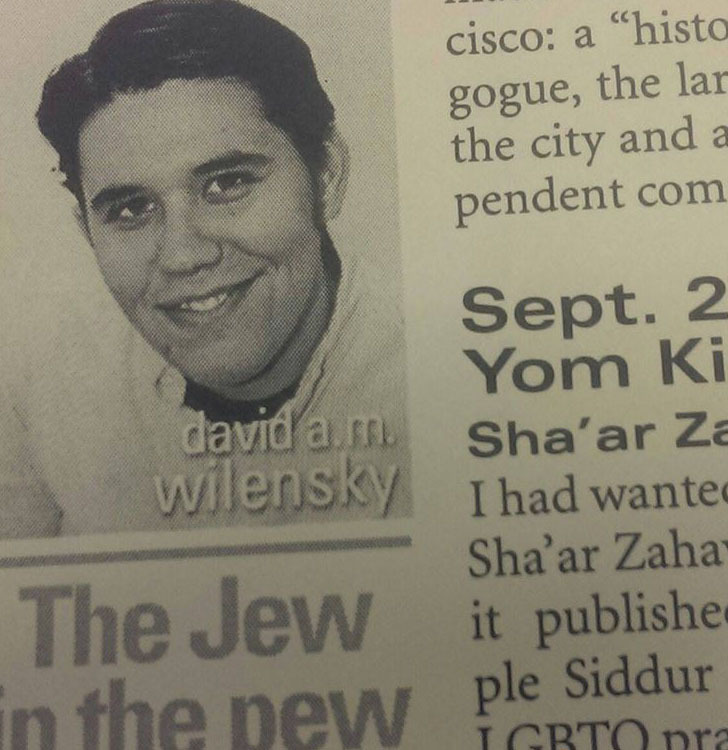 B’nai Emunah’s history is quite unusual. About 20 German Jews got together to found the synagogue in 1949. 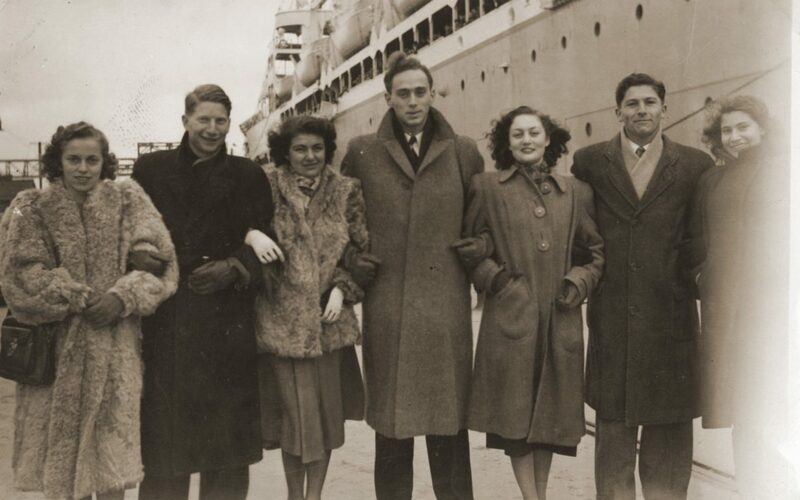 They were part of the community of German Jews that sprang up during World War II in Shanghai, refugees fleeing the Holocaust. Melamut is the third rabbi in the history of the congregation and the first who did not come through Shanghai. 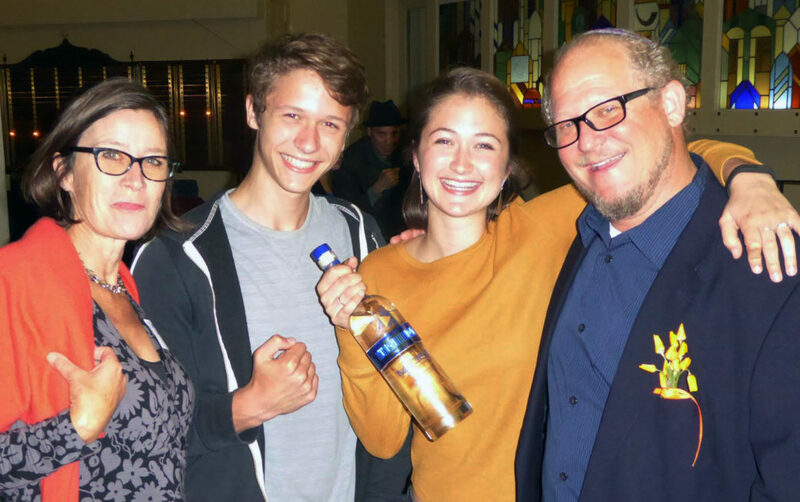 Under their second rabbi, the long-serving and much beloved Rabbi Ted Alexander — “Rabbi Ted,” as he was universally known throughout the Bay Area Jewish community — the congregation transitioned from German-speaking to English. A handful of founders are still alive and active in the congregation. In the social hall a large painting by member Anne Ruth Isaacson honors their place in B’nai Emunah history. 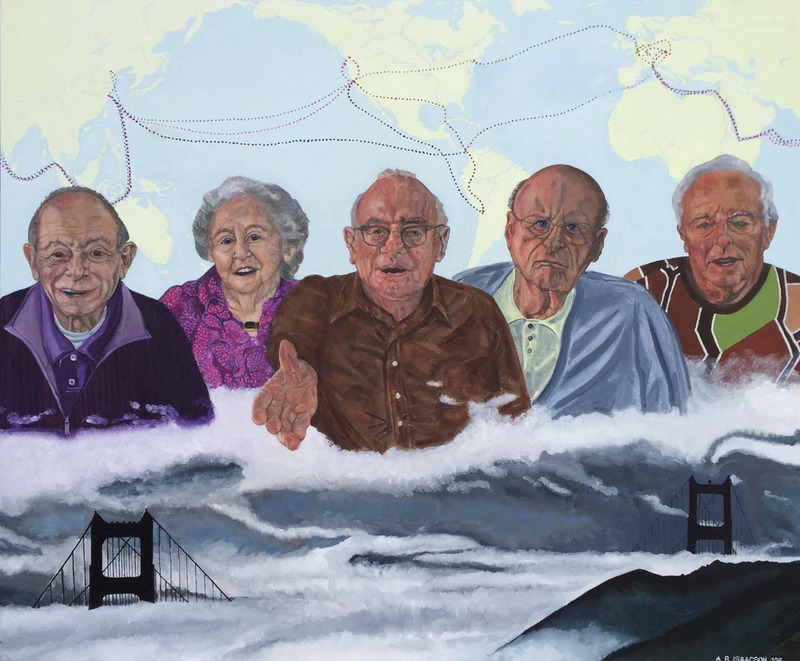 Completed last year, it is an expressive portrait of five surviving members of that original group; behind them is a map of the world, strewn with long, winding lines that show their routes from Germany to Asia to California. The current building on Taraval Street two blocks from the ocean is the fifth in B’nai Emunah’s history. There are no windows — a holdover from its previous use as a nightclub, Melamut tells me. The exterior is wholly unremarkable, save for an unadorned brown corrugated metal tower that protrudes from the roof. Melamut doesn’t know what it was built for; the tower is currently leased to a wireless company that has installed a cellphone signal repeater on it. The service began late, as there were only about four people present at 10 a.m., the theoretical start time. By 10:15 we had begun. The beginning of the service was shockingly brief; one expects a long first half at a Conservative synagogue. The music was mostly standard midcentury American Conservative synagogue music; nothing to write home about. By 10:40 we had already arrived at the Torah service, where I encountered something I’d never seen before. Several congregants took turns chanting the portion. In each case (save for the rabbi, who was the last reader), one person followed along in the Torah scroll with the yad, or pointer, while the reader chanted from a sheet of paper next to the scroll printed with the words, vowels and trope markings. This is, I must emphasize, highly unusual. Typically, the reader knows how to chant the portion and pronounce the vowel-less words from context or memorization. “You probably got the vibe that the goal is participation of as many people as possible,” Melamut later told me. “A lot of the folks who are around and do read from the scroll usually weren’t there that week. Overall, we err on the side of participation.” Fair enough. You probably got the vibe that the goal is participation of as many people as possible. Melamut’s style is conversational. The bulk of the time that would ordinarily be devoted to a sermon was a conversation between Melamut and the congregation. He was like a friend sharing some facts and observations. Unfortunately, their sanctuary is something of an albatross. The bimah is quite high, and Melamut stands up there behind a podium. It doesn’t match his casual style at all, perhaps even hindering him. An elderly man named Guenter, one of the original members featured in the painting in the social hall, was appointed on the fly to read the Haftarah. He did so flawlessly, with confidence, competence and a sure voice — though there was a brief discussion between Guenter and Melamut about whether to do the Ashkenazi or Sephardic Haftarah reading for that week. Despite being as Ashkenazi as possible (the term literally means German), Guenter settled on Sephardic because it was shorter. During Musaf, the repetition of the Amidah at the end of the service, I encountered something else totally new (to me). When we reached the paragraph of the Musaf Amidah that begins “L’dor vador,” Melamut and several children and adults rushed the bimah to dance in a circle while singing that section of the prayer. This completely blew me away. And in a Conservative shul! At the end of the dancing, the children remained on the bimah; while a congregant continued leading Musaf, Melamut gathered the kids to give them a blessing and some candy. I was eager to ask Melamut about this unusual tradition. When he arrived at B’nai Emunah nine years ago, the dance was already well established. At some point, decades ago, a congregant traveled to Germany. There, in a Berlin synagogue, she saw this minhag play out. She brought it back to B’nai Emunah where it has become a weekly event. Start to finish, my visit to B’nai Emunah was one surprise after another. Their history is fascinating. Their Shabbat morning service is full of delightful quirks. And their boastful slogan about friendliness is absolutely true. Jew in the Pew is a regular feature. Send tips about ritual and spiritual goings-on to david@jweekly.com.